You loved our Samurai with its vegetable oil burning Jetta diesel. The BioZuke returns with an eye on getting more power. Drivetrain upgrades will include new running gear, funky beadlock rims & tires, lockers, and 100% new aftermarket axle housings. With a redesigned custom frame, we begin our latest and greatest vision of the Suzuki Samurai! 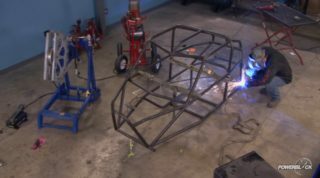 Plus, tips for building your own chassis. Our redesigned Samurai receives a lightweight aluminum body, custom roll cage, rock sliders and more! The Aluminum-tubbed Samurai gains style points with handmade half-doors, HID lights, and a durable paint job. Plus: driveline upgrades for our TJ! We bring our Aluminum-bodied Samurai to the Zuwharrie Trail Ride, and check out all the rigs at the East Coast's premier Suzuki Event. 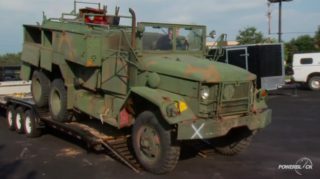 (ANNOUNCER)>> WE'VE BUILT, CRUNCHED, THRASHED, AND SMASHED LOTS OF RIGS OVER THE YEARS. SO WHICH ONE'S OUR FAVORITE? THAT'S LIKE ASKING US TO PICK OUR FAVORITE CHILD. 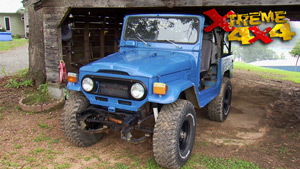 TODAY ON XTREME 4X4, WE THUMB THROUGH OUR FAMILY ALBUM AND CHOOSE OUR MOST PRIZED PROJECT. (IAN)>> THERE'S ONE QUESTION THAT ALWAYS COMES UP WHEN PEOPLE WANT TO TALK ABOUT THE SHOW. THEY WANT TO KNOW AFTER SEVEN AND A HALF YEARS AND OVER 40 DIFFERENT PROJECTS BUILT, DO I HAVE A PERSONAL FAVORITE. WELL I DO, AND IT USUALLY SURPRISES PEOPLE TO FIND OUT WHICH ONE. 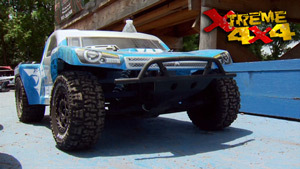 NOW WE BUILT A LOT OF KILLER RIGS HERE AT XTREME, AND SOME OF THEM HAVE BEEN PRETTY UNIQUE, LIKE THE S-10 TRUGGY. JUST AS MUCH SHOW CAR AS IT WAS HILL KILLING RIG. BUILT WITH NO LIMITS AND A PRICE TAG AS HIGH AS SOME PEOPLE'S HOUSES. 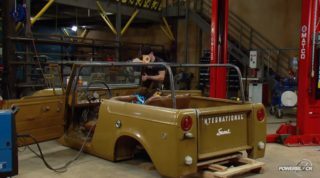 OR MAYBE RESURRECTING A CLASSIC RIDE LIKE OUR 1969 SCOUT BUT ADDING MODERN TECHNOLOGY UNDER THE HOOD. OR MAYBE EVEN THE GO TO TRAIL TRUCK, ONE OF THE MANY JEEPS WE'VE BUILT, FROM CJ'S TO TJ'S, AND A FEW ONE OFF CUSTOMS. BUT TO BE HONEST WITH YOU, THIS IS MY FAVORITE PROJECT WE'VE EVER BUILT, OUR TIN TOP SAMURAI PROJECT. WHY, WELL THERE'S A LOT OF DIFFERENT REASONS. IT'S EVERYTHING YOU'D WANT IN A TRAIL TRUCK IN A SMALL PACKAGE. ROOM UP FRONT FOR TWO ADULTS BUT STILL ROOM IN THE BACK FOR A KID. ONE OF A KIND ENGINE UNDERNEATH THE HOOD POWERED BY AN ALTERNATIVE FUEL SOURCE WASTE VEGETABLE OIL IN THE BACK, AND WE DID IT ALL FOR LESS THAN $5,000. AND I'VE BEEN FEELING A LITTLE GUILTY THAT IT'S BEEN ABANDONED OUT IN THE WAREHOUSE FOR THE PAST COUPLE OF YEARS. SO WE BROUGHT IT BACK IN THE SHOP FOR ANOTHER ROUND OF UPGRADES. IT'LL START UNDERNEATH THE HOOD BY PULLING SOME MORE POWER OUT OF OUR DIESEL ENGINE. AND BECAUSE OF THAT EXTRA POWER, WE'LL UPGRADE THE AXLES BOTH FRONT AND REAR, AND FINALLY SLIP ON A NEW SET OF SHOES. OUR DIESEL ENGINE WAS IN PRETTY GOOD SHAPE, BUT AFTER A COUPLE OF WHEELING TRIPS, WE FOUND A LEAKING INJECTOR THAT WAS ROBBING US OF POWER. BUT INSTEAD OF JUST REPLACING IT WITH A STOCK ONE, WE'RE GONNA UPGRADE THE ENTIRE FUEL SYSTEM. WE PULLED THE CYLINDER HEAD OFF OF OUR ENGINE BECAUSE THE UPGRADE WE HAVE PLANNED FOR THIS TRUCK CONSISTS OF THREE KEY COMPONENTS, ALL OF WHICH WE GOT FROM PERFORMANCE DIESEL INJECTION OUT OF ONTARIO, CANADA. BECAUSE BELIEVE IT OR NOT, NORTH OF THE BORDER, GUYS ARE SOUPING UP DIESEL JETTAS ALL THE TIME. IT STARTS RIGHT AT THE HEART OF THE MOTOR WITH A BRAND NEW HIGH FLOW, HIGH PRESSURE DIESEL INJECTION PUMP. NOW THIS WILL DELIVER MORE FUEL AT A HIGHER PRESSURE UP TO THE INJECTORS AT THE MOTOR. WHEN IT REACHES THE ENGINE AT THE INJECTORS, THEY HAVE BEEN EXTRUDE HONED TO ALLOW MORE FUEL INTO THE ENGINE AND ALLOW IT TO BUILD MORE POWER. AND THEN WE'LL FINISH IT OFF WITH ONE OF THEIR MULTILAYERED STEEL HEAD GASKETS FROM FEL PRO. NOW THIS HEAD GASKET IS OFF A ONE POINT NINE LITER CANADIAN MODEL JETTA. NOW THE REASON WE NEED TO UPGRADE TO THE MULTILAYERED STEEL HEAD GASKET IS BECAUSE WE'RE GONNA TURN UP THE BOOST ON THE TURBO CHARGER, PROBABLY SOMEWHERE JUST NORTH OF 20 PSI. THAT MUCH BOOST WITH A COMPOSITE HEAD GASKET WOULD CAUSE IT TO FAIL. LIKE ALL DIESELS, THE THICKNESS OF THE HEAD GASKET IS CRITICAL. SO WHEN YOU TEAR YOUR ENGINE DOWN, MAKE SURE YOU LOOK FOR THE IDENTIFYING MARKINGS ON THE SIDE. IN OUR CASE, THREE HOLES IN THE OLD GASKET MEANS THREE HOLES IN OUR NEW GASKET. NOW THIS DIESEL ENGINE MIGHT NOT SOUND LIKE IT PUTS DOWN SERIOUS POWER. FROM THE FACTORY IT WAS ROCKING ABOUT 70 HORSEPOWER. BUT WITH EVERYTHING WE'RE DOING TO THIS ENGINE RIGHT NOW, WE SHOULD SEE AN EASY 140 HORSEPOWER WHEN WE HIT THE TRAIL. TO CONTROL THE BOOST IN OUR ENGINE WE'RE GONNA USE THIS SMALL MANUAL BOOST CONTROL VALVE I PICKED UP ONLINE FOR SIX BUCKS. NOW IT WORKS HAND IN HAND WITH OUR FACTORY TURBO AND WASTE GATE. SEE AS THE TURBO BUILDS BOOST PRESSURE, IT SENDS THE PRESSURE DOWN THIS LINE INTO THE WASTE GATE ITSELF. THAT PRESSURE WORKS AGAINST A SPRING INSIDE THE WASTE GATE, AND WHEN WE REACH A SPECIFIC AMOUNT OF BOOST, IT BLEEDS OFF THE EXTRA BOOST INTO THE EXHAUST, AND THAT IS WHAT LIMITS THE POWER OF THE ENGINE. BY INSTALLING THIS WASTE GATE CONTROLLER IN LINE WITH THAT HOSE, WE CAN ADJUST HOW MUCH PRESSURE GOES DOWN TO THE WASTE GATE, TURN UP OUR BOOST AS HIGH AS WE WANT. (ANNOUNCER)>> UP NEXT, WE GET THE ZUK DOWN LOW WITH A REDESIGNED SUSPENSION SYSTEM. AND LATER, WE PUT OUR EXOCAGE TO THE TEST. (IAN)>> WITH THE POWER TAKEN CARE OF UNDERNEATH THE HOOD OF OUR ZUK, IT'S TIME TO TURN OUR ATTENTION TOWARDS THE SUSPENSION. NOW WHEN WE FIRST BUILT THIS RIG, THE WHOLE POINT WAS BUDGET. 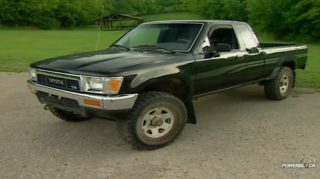 PUT THIS WHOLE TRUCK TOGETHER FOR LESS THAN $5,000, AND TO DO THAT WE USED A LOT OF OFF THE SHELF PARTS LIKE SOME QA ONE COIL SPRINGS AND SOME EDELBROCK EXTREME TRAVEL SHOCKS. NOW THE ONLY PROBLEM WITH THAT IS THE TRUCK SITS JUST A LITTLE BIT TOO HIGH AND IT'S NOT REALLY TUNABLE. SO WHAT WE'RE GONNA DO NOW IS CUT ALL THE SUSPENSION OUT REDESIGN IT THIS TIME WITH A FOCUS ON PERFORMANCE INSTEAD OF BUDGET. WE'RE GONNA TURN OUR ZUK INTO WHAT'S OFTEN CALLED A LOW RIDING ROCK CRAWLER. WE'LL SET THE BELLY HEIGHT AS CLOSE TO THE GROUND AS WE CAN, SOMEWHERE AROUND 20 INCHES. THAT'LL GIVE US A BETTER CENTER OF GRAVITY. WE'LL CONCENTRATE ON THE DROOP OUT OF THE SUSPENSION AND ONLY REALLY SHOOT FOR FOUR INCHES OF UP TRAVEL. NOW THIS MAY LIMIT OUR HIGH SPEED DRIVING, BUT IN THE DIRT ON CRAWLING IT'LL WORK GREAT. WHEN YOU'RE BUILDING A LIGHT WEIGHT CRAWLING RIG LIKE OUR ZUK, A GREAT OPTION IS A GOOD SET OF QUALITY AIR SHOCKS LIKE THESE FOX TWO POINT ZERO PRO SERIES SHOCKS. NOW THEY WORK A LITTLE BIT DIFFERENT THAN A TYPICAL COIL OVER SHOCK, BUT THERE'S A LOT OF THINGS THAT ARE THE SAME. INSIDE THE SHOCK IS A VALVE AND OIL PACK. NOW THAT PROVIDES THE DAMPENING AS THE SHOCK IS CYCLED, BUT THERE'S NO SPRING IN THIS SYSTEM. INSTEAD THE SPRING RATE IS PROVIDED BY A CHARGE OF NITROGEN THAT'S INTRODUCED INTO THE TOP OF THE SHOCK. NOW YOU CAN TUNE THESE SHOCKS IN MANY DIFFERENT WAYS. YOU CAN CHANGE THE VALVE PACK, YOU CAN CHANGE THE WEIGHT OF THE SHOCK OIL THAT'S INSIDE THE AIR SHOCK, AND YOU CAN ADJUST THE SPRING RATE BY CHANGING THE PRESSURE OF THE NITROGEN THAT YOU PUT INSIDE. BUT THE BIG NEWS IS THE TOTAL SIZE OF THE PACKAGE. THE SHOCK IS ONLY TWO INCHES AROUND. SO IN A TIGHT FITTING SPOT LIKE OUR ZUK, YOU GET EVERYTHING YOU NEED, SHOCK AND SPRING IN ONE. BECAUSE OF THE SUSPENSION REDESIGN IN THE BACK OF THIS TRUCK, WE WOULD HAVE TO CUT ALL THE BRACKETS OFF THE HOUSING THAT WAS UNDERNEATH THE BACK OF THE ZUK AND RELOCATE THEM. AND AT THE SAME TIME, BECAUSE OF ALL THE EXTRA POWER UNDERNEATH THE HOOD, WE WANT TO UPGRADE THE INTERNALS OF THAT AXLE AS WELL. SO THE BEST SOLUTION HERE IS TO START WITH A 100 PERCENT CLEAN SLATE. NOW OUR CLEAN SLATE IS RIGHT HERE, TRAIL GEAR ROCK ASSAULT AXLE HOUSING. 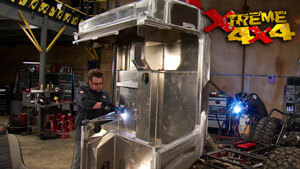 NOW THIS IS A FULLY FABRICATED AXLE HOUSING THAT IS DESIGNED TO ACCEPT THE TOYOTA THIRD MEMBER DROP OUT. IT'S MADE FROM HEAVY DUTY THICK DOM STEEL AS WELL AS DOM AXLE TUBES, BUT THE REALLY UNIQUE FEATURE IS RIGHT OUT HERE AT THE WHEEL. YOU CAN SEE THE AXLE BEARING IS ACTUALLY STEPPED DOWN ALMOST A FULL INCH. 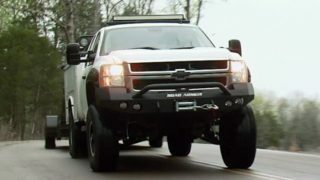 NOW WHAT THAT WILL DO IS ALLOWS THE SHAFT TO RIDE IN THE BOTTOM HALF OF THE AXLE TUBE AND MOVE THE ENTIRE AXLE UP TOWARDS THE BODY OF THE TRUCK GIVING US PROBABLY ABOUT A HALF INCH EXTRA GROUND CLEARANCE. NOW WHEN YOU'RE ROCK CRAWLING, EVERY HALF INCH COUNTS. NOW YOU CAN SEE THAT THE CENTER SECTION TO THIS HOUSING IS OFFSET A LITTLE BIT TOWARDS THE PASSENGER SIDE. WELL THAT'S BECAUSE THIS IS A SUZUKI SPECIFIC HOUSING BECAUSE THE OUTPUT OF THE TRANSFER CASE IS SET OFF TO ONE SIDE OF THE TRUCK, AND YOU CAN GET THEM LIKE THIS OR THE STANDARD CENTERED CENTER SECTION AS WELL. THE FRONT AXLE IS SETUP THE EXACT SAME WAY EXCEPT THE KNUCKLE BALLS ARE STEPPED DOWN TO GIVE YOU THAT EXTRA CLEARANCE. NOW WE'RE GONNA SWAP THESE IN BARE RIGHT NOW SO WE CAN ADD ALL OUR BRACKETS AND TABS AND NOT HAVE TO WORRY ABOUT DAMAGING ANY OF THE INTERNALS. WITH THE JACK STANDS SET AT 19 INCHES, THE CENTER OF THE AXLE WITH OUR NEW WHEEL AND TIRE PACKAGE, THE HOUSING IS PLACED UNDER THE TRUCK. IT IS CROSS MEASURED AGAINST THE ZUK'S FRAME TO MAKE SURE IT'S SITTING SQUARE. FOUR INCHES OF SHOCK SHAFT EXPOSED WILL GIVE US FOUR INCHES OF UP TRAVEL AND 10 INCHES OF DROOP OUT. THEN THE LINK MOUNTS ARE ATTACHED TO THE NEW HOUSING. UP FRONT, THE PROCESS IS THE SAME AS THE REAR. (ANNOUNCER)>> THE LAST TIME WE TOOK OUT THE SAMMY, IT TOOK US OUT! THAT WON'T STOP US FROM COMING BACK FOR MORE, STICK AROUND! (IAN)>> SO FAR TODAY WE'VE MADE A LOT OF REALLY GOOD HEADWAY ON OUR LITTLE ZUK. WE'VE GOT THE SUSPENSION SETUP WITH A REALLY NICE LOW CENTER OF GRAVITY AND WE'VE GOT MORE POWER UNDERNEATH THE HOOD. NOW BECAUSE OF THAT EXTRA POWER, WE WANT TO UPGRADE THE INTERNALS OF OUR AXLE AS WELL. WE'RE GONNA START RIGHT AT THE CENTER OF THE AXLE WITH A BRAND NEW THIRD MEMBER. 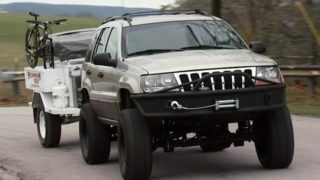 NOW THIS IS A BRAND NEW CONVERSION THIRD MEMBER FROM TRAIL GEAR OFF ROAD. IT CONVERTS IT FROM A LOW PINION TO A HIGH PINION SETUP. IT'LL RAISE THE PINION, GIVE US BETTER DRIVE LINE ANGLES, AND KEEP THE DRIVE SHAFT OUT OF THE WAY OF ANY TRAIL OBSTACLES. NOW INSIDE THAT THIRD MEMBER WE'RE GONNA INSTALL A DETROIT LOCKER LOCKER. THIS'LL GIVE US INDEPENDENT WHEEL MOVEMENT WHEN WE NEED IT, BUT WHEN THEY START TO SPIN, IT'LL LOCK IT TOGETHER GIVING US ALMOST A TRUE SPOOL ACTION. NOW BECAUSE WE'RE SWAPPING OUT THE WHEELS AND TIRES, WE'RE GONNA CHANGE THE GEAR RATIO AS WELL. WE'RE STEPPING DOWN TO A 529 GEAR. 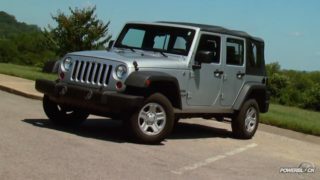 NOW THAT'S A NICE, GOOD, LOW GEAR THAT'LL GIVE US LOTS OF GOOD CRAWLING ACTION WHEN WE'RE OUT ON THE TRAIL. NOW BECAUSE OF ALL THAT EXTRA GEAR RATIO, WE DEFINITELY WANT TO UPGRADE THE AXLE SHAFTS. UP FRONT WE'RE GONNA INSTALL A SET OF TRAIL GEAR DIRTY 30 BIRFIELDS. THIS IS A 100 PERCENT CHROMOLY BIRFIELD WITH 30 SPLINES INSIDE. NOW THAT IS THREE MORE THAN THE FACTORY 27. IT'LL GIVE US MORE PRESSURE ANGLES AND THEREFORE MORE STRENGTH. AND IF YOU REMEMBER, THE REAR HOUSING WAS OFFSET SETUP SPECIFICALLY FOR SUZUKI TRANSFER CASE. NOW WE HAVE TWO NEW AXLE SHAFTS FOR THE BACK FROM TRAIL GEAR AS WELL SETUP FOR THAT OFFSET REAR HOUSING. SO NOW WE HAVE CHROMOLY AXLES ALL THE WAY AROUND, NEW GEARS, LOCKERS FRONT AND REAR. AT THE WHEELS, THE UPGRADES CONTINUE. THE TOYOTA AXLE USES SMALL TRUNION BEARINGS INSTEAD OF BALL JOINTS TO ALLOW THE WHEEL TO TURN. THIS IS A VERY COMMON FAILURE POINT INSIDE THAT HOUSING. SO WE'RE GOING TO REMOVE IT AND REPLACE IT WITH A TRUNION BEARING ELIMINATION KIT. THEN A SET OF TRAIL GEAR SIX SHOOTER KNUCKLES AND HIGH STEER ARMS, AND FINISH IT ALL OFF WITH A SET OF CREEPER FLANGES. A CHROMOLY SPLINED DRIVE SLUG TO REPLACE THE FREEWHEELING HUB ASSEMBLY. WHEN WE FIRST PUT THE ZUK TOGETHER, THIS WAS THE STEERING SYSTEM WE WENT WITH, THE TOYOTA IFS STEERING BOX DRILLED AND TAPPED FOR HYDRAULIC RAM ASSIST. 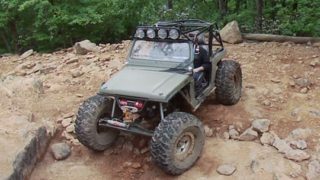 BUT THE ONLY PROBLEM WITH THIS WHOLE SETUP WAS IT HUNG WAY OFF THE FRONT FRAME RAIL OF THE ZUK, AND WE'RE ALWAYS WORRIED WE'D KNOCK A LINE OFF WHEN WE WERE OUT ON THE TRAIL. SO WE'RE GONNA CHANGE ALL OF THAT TO A FULL HYDRAULIC STEERING SYSTEM WE GOT FROM PERFORMANCE STEERING COMPONENTS. NO MORE STEERING BOX INVOLVED, SIMPLY A SMALL ORBITAL VALVE THAT WE'LL MOUNT ON THE FRAME RAIL. THE SINGLE ENDED RAM FROM PSC WILL ATTACH TO ONE OF THE HOLES IN THE HIGH STEER ARM AND GET WELDED TO THE HOUSING USING A SET OF TABS. (ANNOUNCER)>> IAN'S MOM TAUGHT HIM TO NEVER PICK UP HITCHHIKERS, BUT THIS ONE LOOKS HARMLESS, RIGHT, STAY TUNED! 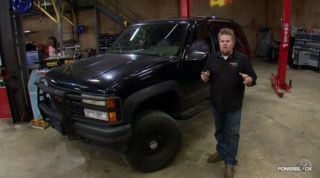 (IAN)>> I'VE ALWAYS BEEN HAPPY WITH HOW THE PIT BULL ROCKERS WE ORIGINALLY PUT ON THE ZUK PERFORMED, BUT WITH ALL THE UPGRADES WE'VE THROWN AT THIS TRUCK, IT JUST MAKES SENSE TO PUT ON A NEW SET OF TIRES. BUT THIS TIME THEY'RE GONNA 39.5 INCHES TALL BUILT FOR A 17 INCH RIM. NOW WE'RE WHEELING THE ZUK IN SOME FAMILIAR TERRITORY, SO WE KNOW THAT THE TREAD PATTERN ON THE ROCKER IS GONNA WORK GREAT. NEW TIRES DESERVE SOME NEW RIMS, AND THESE TRAIL GEAR CREEPER LOCKS ARE THE PERFECT FINISH FOR OUR RIG. 17 BY NINE, FULLY POLISHED, HEAVY DUTY ALUMINUM WHEELS. THE BEAD LOCK FLANGE IS CAST INTO THE WHEEL ITSELF WITH STEEL INSERTS FOR THE GRADE EIGHT BEAD LOCK CLAMPING BOLT. SO WHAT DO WE THINK OF THE ZUK NOW THAT IT'S ON THE TRAIL? OH YEAH, OH YEAH, THIS THING'S A BEAST, IT'S A BEAST! I CAN'T BELIEVE WE MADE IT EVEN BETTER. CLIMB ZUK, CLIMB, OH, LOOK AT THAT, YES! THE ZUK IS UNSTOPPABLE! I LIED, YOU CAN STOP IT. AH, AH, SOME TIMES YOU'VE JUST GOT TO CHOOSE A BETTER LINE. RIGHT AWAY IT WAS EASY TO TELL THAT THE NEW LOW RIDING SUSPENSION ON THE ZUK WORKED GREAT. THE LIMITED UP TRAVEL DIDN'T CAUSE US ANY PROBLEMS WHEN CRAWLING BECAUSE OF THE AMOUNT OF DROOP OUT AVAILABLE WHEN THE AXLE ARTICULATES. THE LARGER 39.5 INCH PIT BULL TIRES OWNED THE TERRAIN WE WERE WHEELING ON. LOTS OF GRIP IN THE DIRT AND EASILY CONFORMED TO THE ROCKS. (CHRIS)>> MAN THOSE TIRES GRIP GOOD. (IAN)>> PLUS THE NEW LARGER SIZE KEPT OUR AXLE UP AND OUT OF THE WAY OF TRAIL OBSTACLES. HAVING A LITTLE EXTRA POWER UNDER THE HOOD, THANKS TO THE PERFORMANCE DIESEL INJECTION PUMP AND NEW INJECTORS, ALLOWED THE ZUK TO TURN IT ON. EXTRA POWER WHEN NEEDED! TRAIL GEAR'S ROCK ASSAULT HOUSINGS NOT ONLY GAVE US A LITTLE EXTRA CLEARANCE AT THE TUBE BUT THE REDESIGNED CENTER SECTION KEPT THE THIRDS FROM GETTING HUNG UP. AND WITH THE NEW 529 GEARS AND DETROIT LOCKERS, THE ZUK CRAWLED OVER WHATEVER WE POINTED IT AT. OH, YEAH! AFTER A GOOD DAY OF WHEELING, BELIEVE IT OR NOT, THE ZUK ONLY BURNED A HALF GALLON OF DIESEL AND ABOUT A GALLON OF WASTE VEGETABLE OIL. TOTAL FUEL COST FOR THIS TRIP, LESS THAN TWO BUCKS! THE ZUK IS STILL MY FAVORITE PROJECT EVER BUILT ON XTREME, AND BELIEVE IT OR NOT, I THINK THIS REDESIGN HAS MADE ME LOVE THIS RIG EVEN MORE.